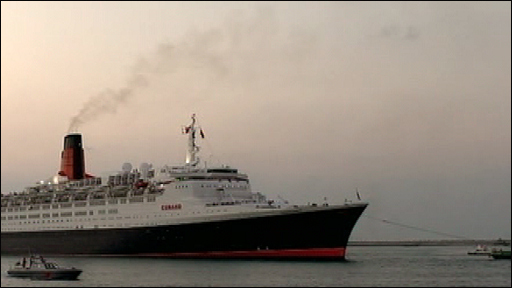 The QE2 cruise ship has been handed over to its new owners in Dubai ready to be turned into a floating hotel. 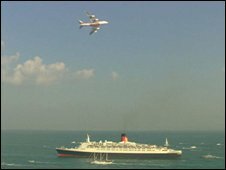 The last passengers to travel on QE2 disembarked on Thursday after it docked on Wednesday afternoon. 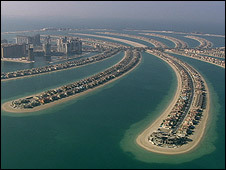 It has been sold for £50m to real estate developer Nakheel in the United Arab Emirates. QE2 left its home port of Southampton for the last time earlier this month on a final two-week cruise following four decades of service. As the Cunard flag came down, the famous foghorn sounded for the very last time. It could be heard for 39 seconds - one for each year of service. Passenger John Little said of the last night on board: "There was crew in tears, there was passengers in tears. His mother, Ellen Little, said she had many "happy, happy memories" from her many trips on QE2. "It was very, very emotional. Everybody on ship, crew included felt that," she said. "[There were] a lot of tears, and not only me, a lot of other passengers as well. They feel the same." The new owners have confirmed that the ship's giant red funnel will be sliced off and placed it on the waterfront and in its place will be a glass penthouse - the most exclusive hotel room in Dubai. Every cabin will be replaced with new, larger bedrooms and the engine space will be filled with a theatre. Nakheel plans to make it the centrepiece of Palm Jumeirah, the palm-shaped fronds of reclaimed land and beach on the Dubai waterfront. The new-look vessel is expected to open in 2010. Tens of thousands of people lined Southampton Water to see the 70,000-tonne ship leave UK waters for the last time on 11 November. The new owners also said the ship's anchor will be given back to the people of Southampton. During its life, QE2 has served as a troop ship in the Falklands War in 1982, been around the world 25 times, crossed the Atlantic more than 800 times and carried more than 2.5 million passengers.